"Chris Tillman #30 of the Baltimore Orioles throws a pitch in the first inning against the Detroit Tigers during Game One of the American League Division Series at Oriole Park at Camden Yards on October 2, 2014 in Baltimore, Maryland." During regular season baseball in Baltimore - rarely does one see a full ballpark. Fast-forward to the American League Division, and Championship, Series and there isn't an empty seat to found. 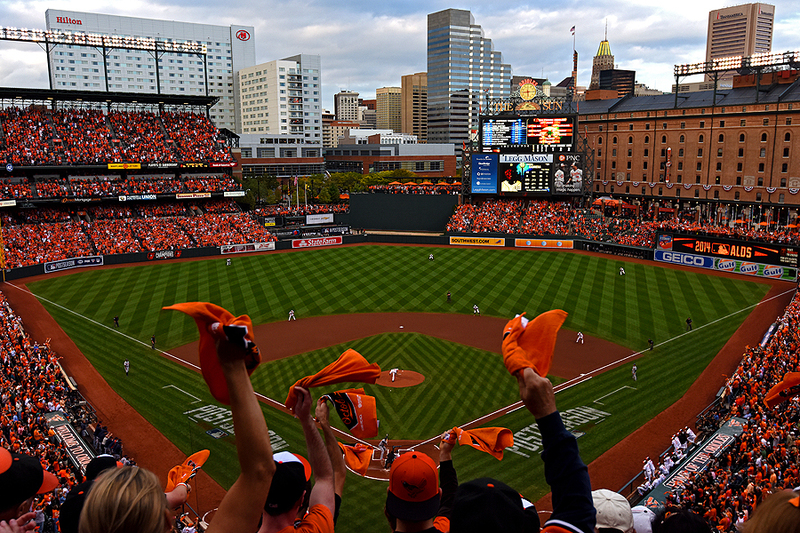 During the first inning, of the first game, of the playoff championship push for the Baltimore Orioles, I climbed as high as one could get in Oriole Park at Camden Yards for a general view. While not the clearest day of the year, the overcast sky worked well with the orange towels that were continually waved by fans. The Orioles are currently two games down to the Kansas City Royals where they need to win two in Kansas City to bring the series back to Baltimore with hopes of getting into the World Series.